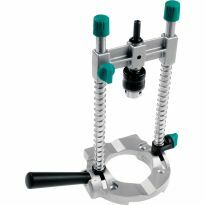 Ordinarily, when assembling a project with T-nuts, it's all too easy to push the T-nut out the back of the workpiece once the bolt is inserted, sometimes resulting in the prongs stripping out the wood. The Riveting T-Nut system prevents this problem by permanently securing the T-nut to the panel with the Riveter Insertion Tool. Simply set the T-nut first with a hammer, then thread the insertion tool into it with a power drill. The tool folds over the end of the T-nut, creating a neat, clean mushroomed end that holds the T-nut firmly in place. 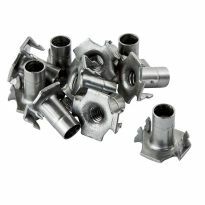 T-nuts available for 1/2", 5/8" and 3/4" material (sold separately). Works as explained. Great tool. The mushroom flange comes loose from the stud when removing the tool from the installed T-nut. Not a big problem, but gives a false sense of tight when using on next T-nut. I'm an Engineer, and almost always can think of something I would change with most tools. After a year I can't hink of anything I would change. 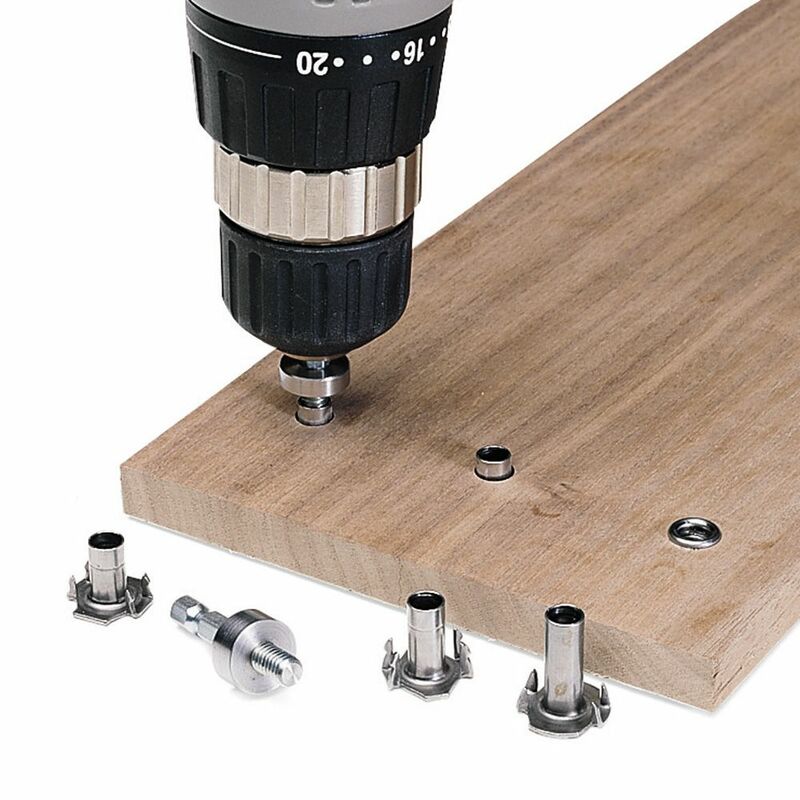 After reading the previous reviews, I was skeptical about this tool and T-Nut set-up. I decided to go forward and try it for myself. I started by checking the threads in the T-Nuts and they were just fine, allowing for free movement. I then drilled a hole in the wood for the T-Nut on a test piece of wood. I attempted to 'seat' the teeth of the T-Nut by using the tool and quickly found out that is not the right way to do it. I continued by 'seating' the T-Nut with a hammer then using the drill and tool to rivet the T-Nut in place. After some practice, I found that using the clutch on my cordless drill, I could get a perfect rivet every time without over screwing the T-Nut. Works good. If you have an application where you take something apart a lot, this is a good answer. Keeps the T-nut from falling out. Great tool for inserting threaded inserts. I read the previous reviews on this product and decided to try it myself. I have a few tips on how to get them to work MUCH easier. 1) Before use, run a 1/4 bolt through the t-nuts from both sides. They need a bit of convincing the first time. I'm thinking that they still have some burrs on the internal threads. Running the bolt through both sides cleans up the threads and reduces the resistance to the spinning insertion tool during insertion. 2) Spritz the insertion tool with your favorite alpha-numerically named water-displacement lubricant. This will help the tool spin freely and reduce the friction of the spinning insertion tool as well. 3) Really pound the t-nut in good. 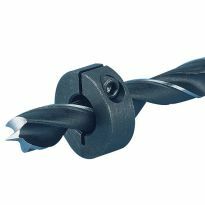 I find that with this, they go in very easily and I have not had any trouble with the t-nut spinning in the wood at all. I think that the issue described in other reviews comes from an excess of friction when the threads of the insertion tool are meshing with the threads in the t-nut. You don't want that. All in all, a GREAT product. I'll be ordering more when I burn through these. I had exactly the same issues as the above reviewers. I resorted to using a hammer to set the T nut, and only later thought of using a forstner or a spade bit to countersink the T nut. This is a reflection of my skill level. I am somewhat more than a wood butcher, but far less than a cabinet builder. I do not own an arbor press. I suggest that Rockwall post instructions for the use of this bit on their website, rather than going to the expense of printing up the instructions and mailing them along with the bit. This would be of great help to more skilled do-it-yourselfers like me. I plan to use this product for other applications: it's great! This great tool has added a another alternative method for easy assembling and disassembling of furniture. It has also added creative options for when one is building furniture. The only challenge I have is the availability of the specified inserts where I am. These little things take a bit to get the hang of. I went through a few of these with many problems. I followed other reviewers suggestions on clamping a backer behind them, and clamp it as tight as you can. Then when driving the insertion bit to set the rivet, go extremely slow with the drill/driver, the slower the better. If you go to fast you will strip out the back of the wood with the t-nut and then it gets very frustrating. 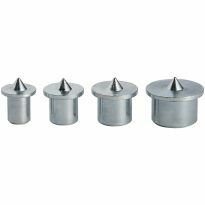 When driving these with my drill I found it worked best when the drill was barely turning and it did help to put a little downward pressure while doing it. Once you get the hang of it and the feel for the speed of the drill when turning the rivet over they work perfectly with no problems. The only other issue I have is with the insertion bit for these. The part at the top of the threads that turns the rivet over on the t-nut has come loose on the thread, could probably lock tite it back in place but it still functions, just backs down the threads when un-threading it from setting the t-nut. I agree that the insertion tool is not of the best quality - although if I hadn't tried to drill these at a higher speed I may not have had this issue. You may want to have one or two extra insertion tools for these on hand just in case. After figuring out how to get these to work they are easy to use and as long as you take a little time and a few extra steps they work without any problems. They are a great fastener and I will be using them for many things. I purchased this product to use in repairing plywood mounting points in boats and furniture. The T-nuts must be set first with a couple of firm hammer blows before using the insertion tool. I ordered the 5/8&quot; T-nuts for 5/8&quot; plywood but found they were better suited for 1/2&quot; plywood. That being said, once they were inserted they didn't come back out. The only other problem I found is the insertion tool itself is made of poor quality steel. The end of the tool that is inserted into the drill snapped off on the first T-nut. I do not know why as it was completely inserted in the drill chuck. The only explanation is poor quality steel. Luckily I could still use it to insert more T-nuts to complete the job. The insertion tool worked as advertised but the T-Nuts used with this tool do not work very well. It works, but... per the other reviews, the inserts tend to spin out while running in the rivet head. This in spite of the fact that the inserts seem beefy and well made. Perhaps the end that is designed to roll over should be drawn into thinner material. I haven't yet found the answer- fast or slow speed, etc. but I do try to grab the back of the insert with vice grips while running in the rivet. The tool itself has not broken, but I am careful to use it delicately. No impact gun! All in all, I like the idea a lot. I hope I can complete my job without problems. It's a nicely made, if somewhat overpriced widget. Unfortunately, the T-nuts it works with are next to useless. So it goes. I tried the first one for practice in 3/4 inch plywood. Turned out great. The second practice one in 3/4 particle board counter top material. Since the particle board is slightly thicker than 3/4, I counterbored the laminate side about 3/32 to allow a flush fit for the head of the rivet and to have more of the rivet protrude out the other end. Turned out great. Now, armed with confidence I got busy with the third one in my project (laminated particle board) which require two of them. I counterbored both sides slightly for a total flush fit. It screwed up badly. Pulled in loose, and I couldn't flair the back end any more to tighten the fit. I attempted to turn the tool with a wrench (instead of the drill motor) to get more torque, and the head started spinning in the particle board destroying the hole. I ended up repairing both holes by gluing in wooden plugs and using seven rivets to get two that will work. Bottom line: no installation guidelines are included, so it's trial and error to find out how much protrusion of the rivet is acceptable for a tight fit. When they pull well...it's a beautiful thing. I have this problem quite a bit hammer in the t nuts and then when bolting the seat to frame, the t nut backs out. I dont think this tool is going to help me much based on the other reviews. Chasing the threads very good idea I do that with almost all t nuts. I also go to a smaller drill bit to fit t nut into plywood. Usually at least one size sometimes 2 sizes smaller bit. Takes a really good hammer blow to drive them home. Not sure I will buy this tool. Can I test drive it first on a few t nuts? I read the other reviews and went really slow and this tool worked as advertised with no problems until the end broke off in my drill 18v cordless. I can still use it, it's a little shorter now. Great tool, cheaply made. While I don't have this product I do know how they are used in industry with success. These are not typically set with a rotary header. The are set with an arbor press with a pure axial force no rotation. Perhaps a few hammer blows will set the insert. Care must be taken to have a solid backup underneath the insert.As it is using a drill is pretty aggressive from a material durability standpoint. A tool that can handle the rotary approach may be able to take careful pounding to set them axially. This same approach is used to set grommets. Needs to be hardened steel. Conceptually, this tool is a really good idea! However, it did not perform well. I bought it with the intent of using it on 24 3/4" Riveting T-Nuts. I used a torque-adjustable driver, beginning at a low torque level, and then increasing torque sufficient to bend the top of the rivet. It required a lot of torque. It worked well for the first two rivets. For the third one, the shank broke, and the tool was no longer usable. I agree with other reviewers who feel that the metal out of which the shank is made is of poor quality. Rockler is a wonderful company, and when I brought the broken tool back to the store, they immediately gave me a refund. I really hope that the manufacturer decides to improve the strength of the metal, since the concept of the tool is a really good one. I should have read these reviews before buying this, exactly the same problems. Perhaps there is a very specific torque setting for this to work, for me it starts to &quot;rivet&quot; and then starts spinning in the plywood. It doesn't seem to matter what kind of plywood you're using, always the same results. Very frustrating. I had high hope for this product as it looked like a great solution. It did not work for me. The t-nuts broke from the plywood and just circled cutting deeper into the back of the wood. The pieces were no longer of use and had to be discarded. Other options are available if you want to do such work prior to using this product. It did not work as advertised. Beware. I must say that upon complaining, my purchase price and shipping were refunded. 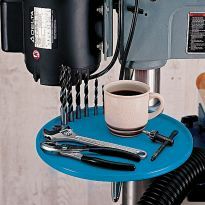 Rockler is a good company that I have used many times in the past. This is the first problem I have ever had. To replace a broken one. I like it. hope it works. I'm making some walking canes and need this tool to thread for the hardware. VERY HELPFUL TOOL TO USE WITH T-NUT. It has a pretty color. I'm ordering for a friend who is a carpenter. I installed many T-Nut Inserts in benches and marine plywood in boats. We just started a 1.800 Bunk Bed business and riveting the t-nuts to the storage drawers increases the quality of workmanship and quality of our family's efforts. This has become one of my favorite tools for building things that cub scouts can't tear out/destroy when they try to assemble the final product. Does this tool fit all sizes of T nuts, or do you need one for each size? Metric versions of the riveting t-nuts available? BEST ANSWER: It seems Rockler does not know if they sell a metric version of this tool, so they are asking customers to answer the question for them. NO, ROCKLER DOES NOT SELL A METRIC VERSION OF THIS TOOL OR THE T-NUTS THIS TOOL USES. Can this be used to rivet any old t-nut or just the special ones? BEST ANSWER: This tool can only be used with the special T-Nuts. You can use it on the properly threaded t-nut but only the special ones will brad at the top. The others will just pull and embed itself in the hole. 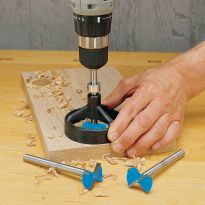 This tool is specifically for the T-Nuts that they are associated with on the Rockler website. IT must be the same thread to use this ,or any insert tool!